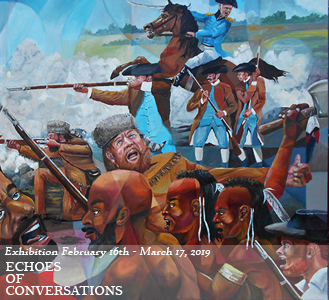 Echoes of Conversations is a tribute to black Americans in art, literature, and poetry featuring the art of celebrated Nashville artist, Michael J. McBride. This sensational exhibition includes a compelling collection of Mr. McBride’s art showcasing masterful techniques in application while telling a story that is thoughtful, powerful and celebratory. Michael J. McBride, a native Tennessean, earned his undergraduate degree in art, from Tennessee State University and his graduate degree in painting from Illinois State University, where he credits Dr. Harold Gregor with providing a world class artistic mentorship. Currently, as an instructor of art at Tennessee State University and former Adjunct faculty at Watkins College of Art and Design and Film school, his commitment to the Nashville art world’s future has always been at the forefront of his own career. Mr. McBride has served curator of the Hiram V. Gordon Gallery at Tennessee State University from 1995 – 2000 and has been the lead artist on many community-based projects in Nashville, Sister Cities Mural Projects as well as Nashville International Airport’s Arts in the Airport program. Michael is a tenured faculty member at Tennessee State University art department, former member of the Board of Trustees for the Frist Center for the Visual Arts, The Arts in the Airport Board member, W.O. Smith Music school board and a member of South Arts southern artist registry. Mr. McBride was featured in Visions of My People, sixty years of African American art in Tennessee, an exhibit organized by the Tennessee State Museum and one of his pieces is included in their permanent collection. He was one of twelve Nashville artists selected by The Tennessean newspaper for inclusion in the Millennium 2000 Collection, a signal honor. A special honor was the Side by Side sister cities exhibition with Belfast, Northern Ireland, featuring 17 artists from Nashville and 17 artists from Ireland. He was awarded in the summer of 2005, with a ten weeks artist in residence in Bermuda with the MasterWorks Museum of Bermuda Art. His current body of work titled “Too Black Too Fast” is a traveling exhibition of art about African- American jockeys and trainers. McBride’s work is included in both private and corporate collections in the US and abroad. His work has been featured on television sitcoms, such as “Living Single”, “The Wayans Bros. Show”, and “The Jamie Foxx Show”. Michael has also illustrated over 70 children’s books and book covers for several publishing groups. The MACC honors Black History Month will also present our Home • Heart • Heritage Black History quilt squares created by adults and children in our community. It is our vision to have each quilt sewn together by local black quilters and become a touring exhibition at the end of the 5-year project.